Join James Rodebaugh, Brûlée Catering’s Executive Pastry Chef, as he teaches us his favorite candymaking techniques for Marshmallows and Salted Cashew Brittle. 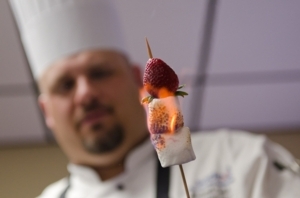 Chef Rodebaugh will walk participants through the culinary processes of aeration -- resulting in the pillowy marshmallow's appeal -- and caramelization, for a mouth-watering, buttery brittle. Come prepared to make (and taste!) your way through these confectionary creations, and leave inspired to try your hand at cooking up new celebration foods for friends and family. Preregistration is required via Eventbrite; tickets are $10 per person.